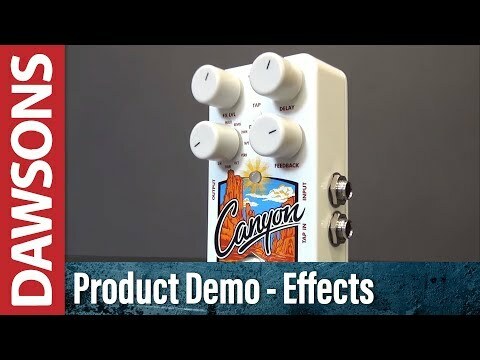 The Electro Harmonix Canyon Delay and Looper Guitar Effects Pedal is one of those rare beauties that defies believe and just leaves you wondering if there is anything it can't do. Don't let its diminuitive size fool you, this little wonder is a mind-blowing unit that expands your tonal possibilities significantly! Whether you're in the studio or taking to the stage, you'll wonder how you got by without a Canyon Delay and Looper in your arsenal. There are 10 different delay types to get stuck into, offering everything from crystal-clear digital to warm tape and more. There is even a Deluxe Memory Man emulation as well as octave delay, shimmer effects, a looper, built-in or external tap tempo with tap divide, and secondary controls to increase the functionality of pedal even further. Using the mode knob, you'll find: ECHO (digital delay); MOD (modulated delay); MULTI (multi-tap delay); REVRS (reverse delay); DMM (Deluxe Memory Man); TAPE (tape); VERB (reverb plus delay); OCT (octave delay); SHIM (shimmer); S/H (sample and hold); LOOP (looper mode with max loop length of 62 seconds). The EHX Canyon Delay and Looper is exceptionally versatile, enabling you to adapt your tone to any genre with seamless precision. Whether you're seeking a tight and articulate snapback, a space-like warble, or a shimmering soundscape, the Canyon has you covered. The unique multi-tap delay creates a startling effect, which can be attenuated to produce a delightful harp-like sound. Classic plate-reverb comes via the VERB mode, and you can even adjust the tone of the reverb - perfect for old school surf rock and classic rock vibes. The Deluxe Memory Man emulation gives you a representation of the classic bucket-brigade analogue delay. Using the secondary knob mode, the modulation can be attenuated for even sweeter tones. The OCT delay offers a repeat that is progressively pitch shifted one octave above, whilst the secondary knob also generates a sub-octave, creating a dazzlingly brilliant response. The SHIM mode offers an instant shimmer effect that makes use of an octave-shifted response based on modelling a chain of four Electro Harmonix pedals (Soul Preacher/POG2/Stereo Memory Man with Hazarai/Stereo Memory Man with Hazarai). The internal looper mode allows you to record up to a maximum loop length of 62 seconds, which is stored until overwritten or erased. The Feedback control attenuates the level of the loop that is preserved when overdubbing. To get you up and running immediately, the Electro Harmonix Canyon Delay and Looper Guitar Effects Pedal is supplied with an EHX 9.6DC200mA power supply unit.